It’s very rare to come across an episode of Land of the Lost -- in any season -- that I vehemently dislike and judge almost entirely worthless. But “Survival Kit,” the second episode in the third season catalog, certainly fits the bill. In this story, an arrogant Cro-Magnon man, Malak (Richard Kiel), whom the Sleestak apparently revere as “The Exalted One,” seizes control of the Land of the Lost’s river and threatens to drown the denizens of the Lost City unless he is continually brought “tribute.” He also wants a slave to serve him. The Marshalls see the Sleestak take their “survival kit,” after Uncle Jack recovers it from the Marshalls’ raft at the bottom of the lagoon and Uncle Jack realizes they must retrieve it because it contains medicine that can treat Holly (Kathy Coleman), who is suffering from a terrible fever. Accordingly, Jack (Ron Harper), Will (Wesley Eure) and Chaka (Philip Paley) visit Malak in his stone home, a structure also never-before-seen in the Land of the Lost, and attempt to trade goods for their survival kit. Jack treats Malak’s tooth-ache and tricks him with the “magic” of a flash light before Malak acquiesces to his demands and also agrees to release control of the river. Holly is healed, and Malak is never seen nor spoken of again. But first, let’s get to Malak. He is apparently a long-time denizen of the Land of the Lost, but in two seasons worth of episodes, there has been no mention of his presence. One might think his presence is important, since he -- like the Marshalls -- is a human being. At one point in the episode, Enik reveals that the Sleestak live in fear of the time when the moons align and they must give tribute Malak. So he has apparently appeared before, and regularly at that. Yet none of the Marshalls (or Chaka) have noticed Eegah hanging around? Or made note of his impressive home…which controls the river? Then, there’s the matter of the titular survival kit. It apparently sank to the bottom of the lagoon when the Marshalls arrived in the Land of the Lost, but as you’ll remember from the opening credits of the first two seasons, the raft did not land in the lagoon. It landed on dry land. Remember the image of the family unconscious in the raft, as Grumpy’s roar awakens it? So had did the raft -- on dry land -- sink? And while on the topic of the survival kit, how is it that Jack recovers it from the lagoon so quickly and easily? Are we to believe that Lulu is the only critter in Land of the Lost Lagoon? It’s hard to know which characters gets the worst of this particular story, but my vote would go to Enik (Walker Edmiston), the evolved Sleestak from Altrusia’s distant (but evolved) past. Here, he misinterprets the Library of Skulls’ wisdom and responds by, essentially, robbing the Marshalls’ temple for “tribute” items. A man who knows the great sweep of history and who can control time doors is here thus reduced to stealing crockery to appease a bully and cave-man. By the way, the Skulls in the Library pretty much reveal that Malak is not a god, because Gods would not demand human things…like crockery. 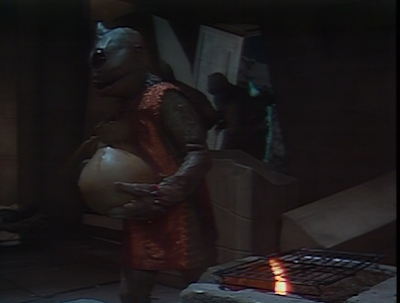 But Enik misses the clue entirely, and acts as stupidly and irrationally as his Sleestak cohorts. This episode also reduces significantly the terror of the Sleestak, as they are held at the mercy of a giant brute in a fur loin cloth. It’s a low-point not merely for Enik, but the entire Altrusian race. I can’t believe that ten or eleven Sleestak from the Lost City couldn’t overwhelm the guy or his home. 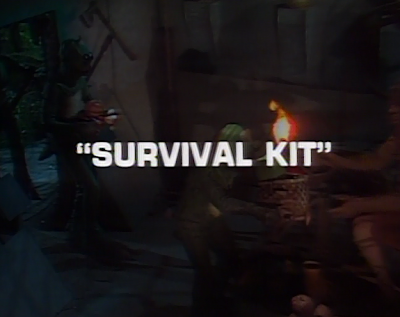 The cheapness of “Survival Kit” is also shocking. We never even get one full-exterior shot of Malak’s home, which an is important oversight considering that last week (“After Shock”) the Marshalls and the Sleestak were fighting over the only real estate available: the Old Temple. Only here, suddenly, Malak’s got a man-cave, literally. All of this may read like nitpicking, but the obvious conclusion about “Survival Kit” is that it is written with absolutely no regard or respect for Land of the Lost history. Malak surely would have been noticed in years past if he was there, and I can’t believe it is an established Sleestak tradition to kowtow to his demands. And we know -- from our lying eyes -- that Marshall raft never sank in the lagoon. And worst of all, to dramatize this miserable, entirely unworthy story, Land of the Lost must make a fool of the dignified, regal Enik, and even of his menacing fellow-denizens in the Lost City, the Sleestak. When fans claim that they dislike the series’ third season, “Survival Kit” must be a prime reason why. There’s absolutely no attention paid to series continuity, detail, or even characters. It’s a dramatic low-point for a series that had previously made it a point never to talk down to kids. John correct review of "Survaval Kit". I agree. I feel that in the third season they "dumbed down" the series by as you stated, no regard or respect for Land of the Lost history. This is how a series goes wrong and probably why a fourth season never happened. You're right. I love the series, have since I first saw it in my early 20s. But, wow... I never finished the third season, and this episode is a not incosiderable part of why.